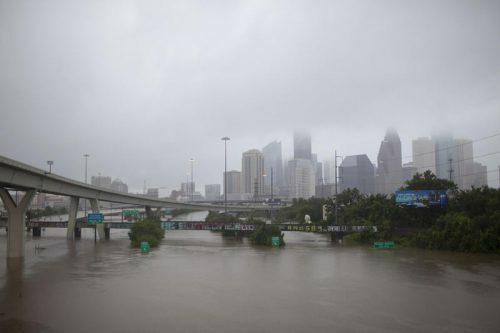 The National Weather Service said Sunday afternoon it expected up to 50 inches of rain in some areas of Houston. Residents west of the Addicks and Barker Reservoirs in Houston are being advised to evacuate their homes on Monday, via Houston Public Media. Residents west of the Addicks and Barker Reservoirs in Houston are being advised to evacuate their homes on Monday, if they haven’t done so already. The Army Corps of Engineers began controlled releases from the reservoirs shortly after midnight. The water is being released into the already flooded Buffalo Bayou, to flow into the Houston Ship Channel. But the levels in Addicks and Barker are still rising, at more than 1 foot per hour. That’s fueled by surging creeks that empty into the reservoirs. The result is that water is backing up to the west of both reservoirs. Thousands of homes in the way are either already being flooded or at risk. Officials say that they had to allow the controlled release now. They say the alternative would have been an uncontrolled release later. That would cause more damage, at the very least. But allowing the water to continue building could also threaten the structural integrity of the Addicks and Barker Dams. Those two dams are rated among the most unsafe in the country. Volunteers joined emergency teams in pulling people from their homes or from the water. The flooding was so widespread that authorities had trouble pinpointing the worst areas. They urged people to get on top of their houses to avoid becoming trapped in attics and to wave sheets or towels to draw attention to their location. The rescues unfolded a day after Harvey settled over the Texas coastline. The system weakened Saturday to a tropical storm. By early Monday, Harvey had shifted a little closer to Texas, hovering about 20 miles (30 kilometers) east of Victoria, with sustained winds of about 40 mph (65 kph). The National Hurricane Center said it continued to edge in a southeasterly direction at 3 mph (4.8 kph). This entry was posted in KRTS News, KXWT News and tagged Houston, Hurricane Harvey. Bookmark the permalink.